EpiCat is your opportunity to flip the genetic switch and become the freak that nature had never intended . If you want to get really big, really shredded; without changing your workouts or diet around the real answer lays in genetic modification. The human body has many regulators that turn on automatically throughout our lives. One of them is myostatin, released by our muscles to make sure we don’t grow uncontrollably huge so that we can’t move or do anything functional. Remember, thousands of years ago we were hunters, not bodybuilders looking to get jacked. The key ingredient in EpiCat is our proprietary blend headlined by epicatechin; a substance found naturally occurring in cocoa beans and commercially eaten in dark chocolate. 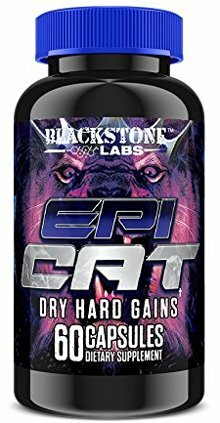 Epicatechin has been scientifically found to interfere with our muscles release of myostatin, by releasing another molecule called follistatin. There’s nothing special about follistatin other than the fact that it acts as a distraction on the myostatin. With our muscles not being properly regulated for size due to this interference the result is more muscle growth than our bodies could ever imagine. Why has nobody used this before? Mostly because nobody wants to eat pounds of dark chocolate per day to see the effects the old fashion way. EpiCat is highly concentrated and fortified with antioxidants green tea for an overall healthy mechanism for maximum muscle growth naturally. Try it for 90 days and notice how easy it was to reach your untapped potential.